An intense and violent film ripped right from the headlines, writer/director Ben Young’s “Hounds of Love” is a masterpiece of tension and fear. Hounds of Love is a movie that will stay with me for a while, keeping me awake at night to wonder “Where is my daughter right now?” This film immerses the audience right into the middle of any teen girl and her parents’ worst nightmare. 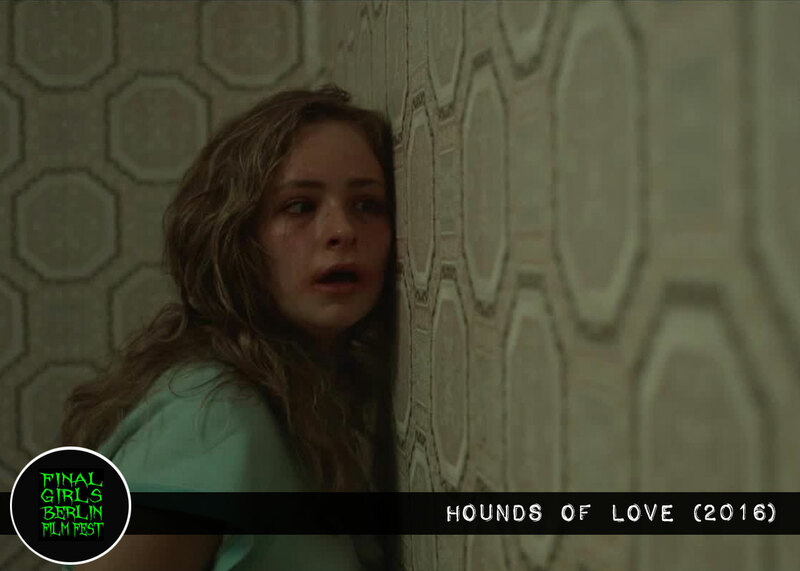 A hit at horror film festivals for some time now, Hounds of Love has won many awards, despite how deeply it can upset its viewers. The Isolated city of Perth, in Western Australia brings us a history of dark stories and true crime. Hounds of Love is loosely based on real life ‘80s serial killers David and Catherine Birnie. The couple abducted, brutally tortured and murdered four young women from Perth. The fifth intended victim got away, leading to their eventual arrests. Ben Young’s directorial debut draws upon the story, bring us a gripping, claustrophobic and violent tale. The film, which has been off-putting to some festival audiences, is difficult at times to watch. But it is still a riveting, suspenseful film with some of the most powerful and emotional performances I have seen in a long time. It’s hard to view this kind of ugly honestly, but it’s an important story to tell. These kinds of things happen every day, in our own neighborhoods, without us even knowing. For me as a mom, this film was much more sinister than a simple horror flick. Luckily most of the violence was insinuated and off screen, so it was watchable. Sexual assault is hard for me to handle at times, but writer/director Ben Young was able to tell a terrible story without being too graphic, yet there was no doubt about how horribly perverse these monsters were. I won’t say why, but I’m pretty sure I will never again listen to the Moody Blues song “Nights in White Satin”, without getting cold chills and thinking of this film. As the movie opens, we feel the heat and oppression of a hot day. The languid visuals show us the world through a hunting predator’s eyes. Slow-motion takes us through neighborhoods with regular people doing their normal daily things. We have all been told “Don’t talk to strangers.” As parents we drilled it into our kids’ heads. So even though it’s predicable, I still wanted to scream no, don’t get into the car, but of course a young girl does just that. We don’t see her die, but there is enough evidence that we know in our hearts what will happen. The uneasy feeling builds, and we start dreading who will be next. The next victim of the sick and twisted couple is 17-year-old Vicki Maloney, played incredibly by Ashleigh Cummings. Mad at her mother Maggie (Susie Porter) for forbidding her to go to a party, she sneaks out and has the bad luck to run right into the sadistic hands of John and Evelyn White (Stephen Curry, Emma Booth) and into the ugliness of their life. The character of John White is a pathetic one. A mean-hearted killer, we know he is the reason for all the pain and suffering. We can’t feel sorry for his emotionally dependent wife, but we can see that Evelyn White is suffering. She is a woman who is too broken to do anything except what her husband tells her to do, no matter how cruel he is to her. This ultimately is what our teen uses to try an escape, attempting to get back to the mother she believes still is looking for her. Even though this is a film about abduction and torture, it is also a story of redemption. It is about mothers and daughters, and the bond females can have even in the worst of situations. The difficulty in watching the violence in the movie, is balanced by watching Vicki, and the depths of her character, as she works out ways to make her escape. This is not a movie for everyone, but it is a psychological thriller worth your time. Seeing strong women characters is always fulfilling for me, and I loved Vicki’s resilience. The sleaziness of the characters makes us want them to fail, keeping us rooting for our victim. The soundtrack to the film had some very interesting choices and the music always seemed to fit in just right. The title of the film confused me, so I looked it up. The name came from a 1986 Kate Bush song that was too expensive for the filmmakers to get. Reading the words to the song and understanding the meaning, makes it a perfect title, and I thought that was pretty cool. The song deals with awakening sexuality and the transition from adolescence to adulthood. Check out the lyrics to the song sometime. I had never really listened to her songs before. With wonderful visuals and stellar acting, Hounds of Love took me to a deeply scary place and left me emotionally drained. I knew it was irrational, but I needed to call my daughter afterwards, just to check if she was safe.